Days of Our Lives&apos; supercouple EJ DiMera (James Scott) and Sami Brady (Alison Sweeney) gave us must-see TV for most of 2014. Unfortunately the NBC soap did not save the best for last. After surviving Nick Fallon&apos;s (Blake Berris) every treacherous stunt, his affair with Abigail (Kate Mansi) and the hostile takeover of his family empire, EJ was gunned down in a park by a day player. Sami grieved for about 10 minutes, before heading to Hollywood with stars in her eyes. To borrow from Avril Lavigne, so much for our happy ending. "Who&apos;s The Daddy?" storylines are a tried and true soap staple, but for them to work we have to care about everyone in the equation. Burgess Jenkins awkwardly felt his way through as a recast Billy Abbott in 2014 on The Young and the Restless. The soap did the poor guy no favors by putting him in such a high stakes, front burner arc. Villy fans waited years for Billy and Victoria (Amelia Heinle) to get their miracle baby. It would have been nice if the couple still had a stitch of chemistry. Speaking of Stitch, Sean Carrigan and Heinle sizzle in every scene they share together. Likewise, Jenkins and Melissa Claire Egan (Chelsea) are great as a budding TV couple. Isn&apos;t it about time this show reevaluates who their endgame couples should be? We love it when soap operas bring back popular characters from the past to drive new story. We just need for said stories to be somewhat entertaining. No way do we buy late publishing wunderkind Jack Deveraux (Matthew Ashford) ever signing over his future book royalties to short term wife of convenience Eve Donovan (Kassie DePaiva) on Days of Our Lives. It was painful to watch Eve and Jennifer (Melissa Reeves) hissing at one another about Jack&apos;s POW memoir and those blasted movie rights! Thankfully, Eve&apos;s focus has shifted to another one of Jack&apos;s assets — his hunky teenage son. Jessica Collins deserves a medal for having to endure all of the cockamamie scenarios The Young and the Restless puts Avery Bailey Clark in. It was bad enough when the talented attorney contemplated abandoning her career to bake cupcakes on the web; then they threw in a stalker. A mystery person making snide comments about her web series was so alarming the chief of the Genoa City police department had to become personally involved! By the time Y&R revealed the stalker was Avery&apos;s cute cameraman Austin (Matthew Atkinson), we hoped we&apos;d never hear about dessert pastries again. Eat Pray Love may have done well at the box office, but it flopped on ABC Daytime&apos;s General Hospital. When beloved, formerly-vapid fashionista Maxie Jones (Kirsten Storms) came home with Levi Dunkleman (Zachary Garred), a grungy, long-haired Australian hippie, we thought the show was simply giving us a Vegan Spinelli (Bradford Anderson) bot. It turned out Levi was really the son of Peter Harrell, an 80&apos;s era enemy of Maxie&apos;s super spy parents Frisco (Jack Wagner) and Felicia (Kristina Wagner). Pete Jr., an agent for the WSB, wanted to avenge his ailing, presumed dead dad by killing Maxie. We wanted to chip in to buy Maxie a pair of this season Cartulos, by the time she stabbed Levi/Pete dead at Crichton-Clark and tongued Nathan West (Ryan Paevey) down over his bloody corpse. It was downright shameful what soap opera icons Jess Walton and Tristan Rogers were subjected to in 2014 on The Young and the Restless. The CBS soap was so proud of itself for snatching Rogers from General Hospital. Ironically, Robert Scorpio—the iconic hero Rogers played on the ABC soap—had more to do off screen in 2014 than mobster Colin Atkinson did on camera in fictional Genoa City. The bigger crime was watching Walton&apos;s legendary Jill Foster Abbott spend the year trying to solve a Scooby Doo mystery concerning the late Katherine Chancellor&apos;s (Jeanne Cooper) music box. We hope Chuck Pratt&apos;s first task as the show&apos;s new head writer is giving Jill and Colin a story worthy of the actors who portray them. As much as we will miss Kim Matula, we needed a break from Hope Logan on The Bold and the Beautiful. At first it was fun watching Hope give Liam (Scott Clifton) a taste of his own fickle medicine, by being with both him and his brother Wyatt (Darin Brooks). After all, Liam did ping-pong back and forth between Hope and her stepsister Steffy (Jacqueline MacInnes Wood) for years. The year 2014 saw Hope succeed both Liam and Ridge (Thorsten Kaye) as the most indecisive creature in SoCal. This girl actually looked those brothers in the face and told them she wanted to date both of them! Eventually Hope made her choice; she wanted to be with Liam. However, she married Wyatt when Liam was late for an international date. Back in Los Angeles, a pregnant Princess Hope banished Wyatt&apos;s quirky mother Quinn (Rena Sofer) from their lives. We were sad to watch her tumble down those stairs and lose the baby, but there&apos;s no way this girl is ready to be a mother, or in an adult relationship for that matter. Let&apos;s hope for the future our Ms Logan grows up overseas. The ability to suspend one&apos;s disbelief is as necessary to enjoy Frank Valentini and Ron Carlivati&apos;s General Hospital, as 3D glasses are to truly experience the wonder of a Marvel superhero movie at the multiplex. That being said, the majority of the Daytime Confidential crew couldn&apos;t get on board with the lack of logic being applied to the arc that found corporate shark Tracy Quartermaine (Jane Elliot) being duped by a Luke (Tony Geary) doppelganger not once, but twice in 2014! Sure, Tracy&apos;s always been a bit of a fool for love, but to sign over 15 percent of ELQ to a league of international criminals, all for a guy even Stevie Wonder could clearly see is not Luke Spencer? Yeah. No. While we love GH&apos;s big, umbrella capers, in 2015 we&apos;d like it if they didn&apos;t cause generally smart women to look like colossal dumb asses. With so many core characters missing in action on Days of Our Lives, we can&apos;t figure out why the soap&apos;s writers decided to create an entirely new family of bland, Ozark stereotypes. All My Children bombshell Chrishell Stause was wasted as cry baby physical therapist Jordan Ridgeway/Tammy Sue. Giving her a hunky-but-dull brother and a pervy stepfather didn&apos;t help matters. Jordan, Ben (Robert Scott Wilson) and Clyde (James Read) were afforded much too much airtime in 2014. Why should we care about these people? Who gives a barrel of hay about what happened to their mama back home in Poplar Bluff? If Stause had been cast as Maggie&apos;s daughter Sarah Horton, Read as a recast Bill Horton and Wilson as Andrew Donovan, we doubt they&apos;d be on a worst list. Just saying. We knew the moment Jill Farren Phelps started gushing about casting Twin Peaks legend Ray Wise in interviews, we were headed for trouble. If only soap producers could ever get this excited about the veterans already on their canvases! 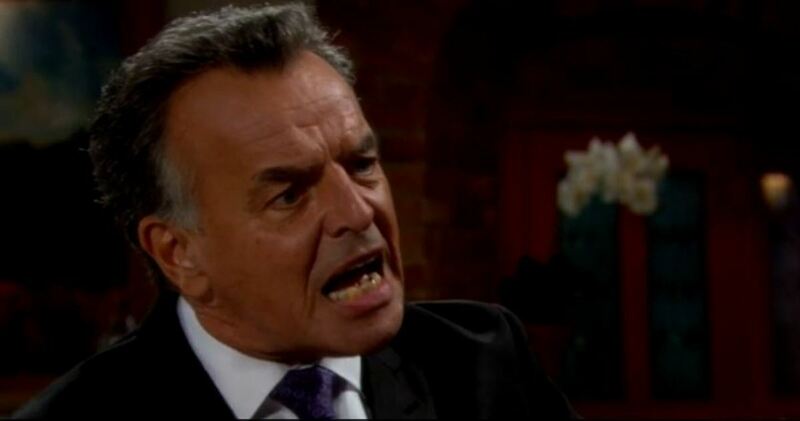 Wise&apos;s Ian Ward ate Genoa City alive in 2014, constantly pulling silly pranks and shenanigans on The Chosen One aka Dylan McAvoy (Steve Burton). Veterans Melody Thomas Scott (Nikki), Doug Davidson (Paul), Eric Braeden (Victor) and Lauralee Bell (Christine) were relegated to supporting status, as Y&R did its damnedest to set up Dylan vs. Ian as the new epic feud of the century. It would have been nice if Ian every managed to pull off anything truly menacing or suspenseful. Sheila Carter (Kimberlin Brown) he was not. Heck, he wasn&apos;t even as watchable as those bozo doppelgangers from MAB&apos;s "So Long, Sister Killer" farce.